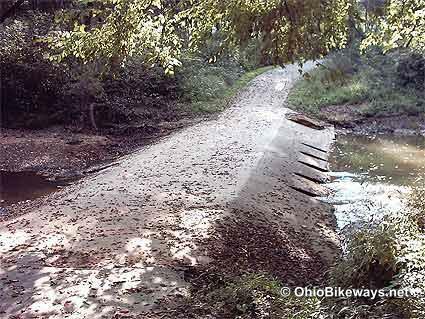 Heath, OH - "...Most of the over 4-mile-long trail will remain open with access permitted from both the east and west parking areas. "From the east parking lot at Toboso, nearly 3 miles of trail remains open while 3/4 of a mile of trail is still accessible from the west parking lot on Brushy Fork Road. Bulldozer work has reopened the closed section of the trail, allowing access to the full length of the bikeway once again. This is not a permanent repair, however, and visitors are asked to use extreme caution when using the trail here. From newarkadvocate.com, "...The western most mile of the path, closed a year ago because of hillside slippage next to the path, will not likely be opened this year, according to the Ohio Department of Natural Resources. "...Williams said he has heard a cost estimate of $1 million to make the repairs. ODNR would not confirm the estimate." After hauling our kayaks and bikes to the Brushy Fork Trail entrance for a day of fun on the river and pedaling back on our bikes, we were very disappointed to find out that the bike trail is STILL closed - thus, putting an end to our day's activities. The bike trail and river are heavily used in this area by citizens who want to enjoy the great outdoors in our area. Now, I find out that the ODNR can't even tell us when the bike trail will be reopened. This is very disappointing for those of us who often like to take advantage of the "pedal and paddle" option at Black Hand Gorge. I think the ODNR needs to get in gear to get this project cleared. Facilities: Latrine at east end of the trail (no water). Parking: At both ends of the trail only. Main trailhead (& eastern terminus) in Toboso (Note that Google lists the address as Heath, OH). West end parking. Worth Noting: 10 miles of hiking trails reside in the park as well. The trail received a new asphalt surface in late 2013. In 2014, a hillside slippage caused an indefinite closure. Thanks to a man and a bulldozer, the closure was lifted in 2015, but no timetable has been given for the permanent repairs that are required. DNR notice on the closure: "Temporary repairs have been made to the damaged section of the bike trail. The repaired section of the trail is open but remains unpaved and unstable. Those that choose to use this section of trail should proceed with extreme caution." Current reports suggest that about .1 mile of the trail has a rough surface, while the rest of the trail is in very good condition. Expect to walk your bike in the rough section. This path has some of the best scenery Ohio has to offer: a river and gorge, water trickling from steep rock ledges, rock formations and cool, thick woods. The trail also crosses a creek and passes between huge sections of rock that had been blasted through to allow a former rail line to pass. I marveled at how cool and damp the trail remained in the shaded gorge despite the warm summer temps. A thin layer of green moss adorned the edges of much of the pavement. Though I'd entered the gorge with a light sweat on an 80+ degree day, I soon cooled on the trail in what felt like a perfect 70 degree world. At the eastern end of the park - which serves as the main entrance - the trail begins at the latrines opposite a small log cabin. For the first 3 miles or so the trail descends slightly westward until it reaches a creek crossing. This is perfect for slow cruising to check out the scenery which includes: Blackhand Rock, the gorge river and the tall rock walls created by the cut-through along the former rail line. I walked my bike through the deep cut section and down to the Blackhand Rock viewing area to better experience the nature here. After crossing the creek, the trail works its way out of the gorge and ends at a small parking lot. If you're the type of person who prefers to take your time exploring a trail, this one's a "must see." Aside from the scenic beauty along the paved trail, there are also many hiking trails to explore. One such trail on the opposite side of the river features a tunnel through solid rock that at one time accommodated an electric rail line. 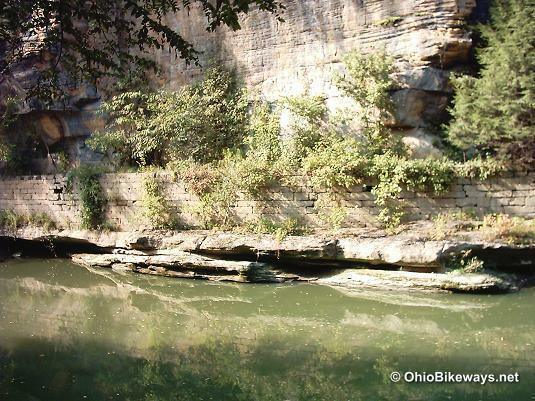 Don Williams pointed out that there are also sandstone Ohio Canal locks that were mined at an on-site quarry off the main trail. You can also canoe the river to get a perspective from the bottom of the gorge. Allow yourself at least a few hours to thoroughly explore the area. 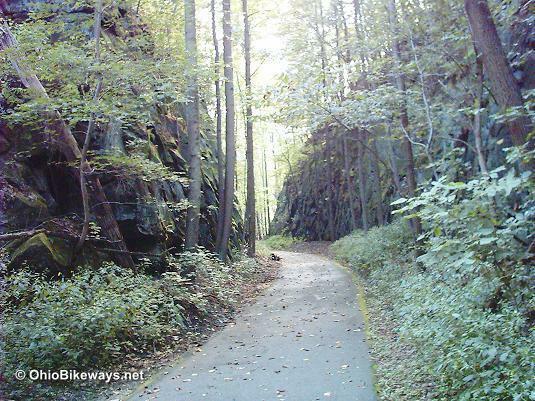 If pedaling less than 10 miles in your round trip ride is not enough mileage for you, consider visiting the nearby Panhandle Trail that connects nearby Hanover with the east side of Newark, OH.